Well, pleasingly, even though I’ve had a fair few book confessions in October, I did manage to read eleven books, most of them from the physical TBR as I took BookCrossing registered books on holiday at the start of the month. So the TBR is looking a little smaller than at the start of October. You can see it’s shuffled around a bit, as I took books out of order and then read and released them in Cornwall. The front shelf finishes at the pink of Simon Armitage’s “Gig”. I’m currently reading Hal Higdon’s “Run Fast” which is actually not as annoying to this slow runner as I’d feared, and is quite a sensible read about interval training, etc. I’m hoping to take it to do a running book swap at our running club’s Awards Night next month along with some more running stuff, if I get through it. 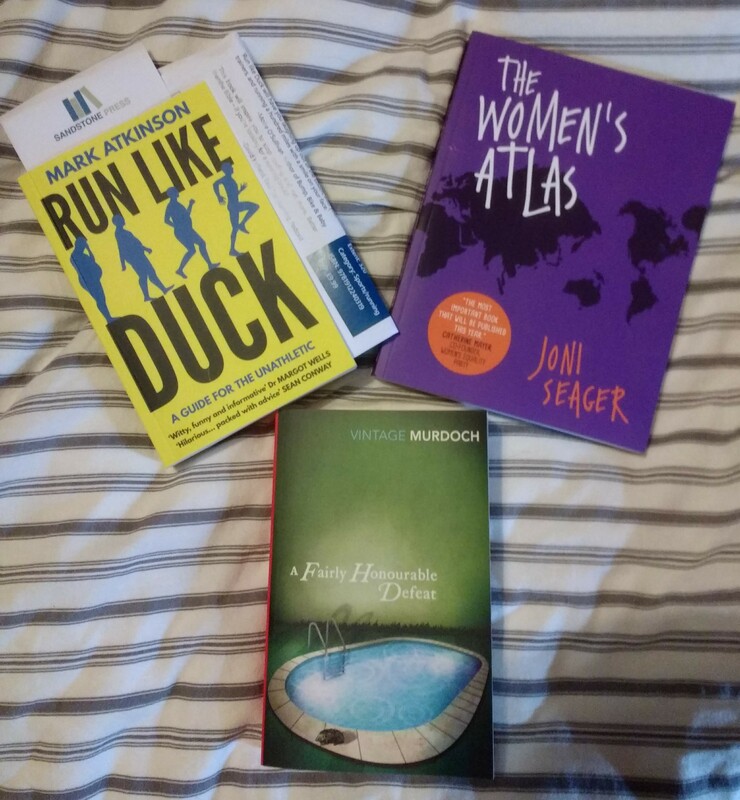 Next up will be project and review books, so the treat of Iris Murdoch’s “A Fairly Honourable Defeat” (a favourite of mine on all other readings) and then Joni Seager’s “The Women’s Atlas” for Shiny New Books and Mark Atkinson’s “Run Like Duck” kindly sent my way from the publisher by the lovely Lisa Jackson (thanks, Lisa!). I’ve also recently won on NetGalley “Jog On” by Bella Mackie (mental health and running) and “Let Her Fly” by Ziauddin Yousafzai (Malala’s father!) and Louise Carpenter, so hoping to get all these read and reviewed this month. And then on the TBR, it’s Christmaaaas! OK, it’s Christmas last year but there we go: I’m not quite a month behind. I do like to get Christmas and birthday books read before the next Christmas, to make room for the inevitable (and wonderful) book flood. It’s a mixture of novels and books about books, really – Mary Webb’s “Gone to Earth” (which has crept out of the picture on the left), Karen Joy Fowler’s “We Are All Completely Beside Ourselves” (I’ll admit I’m not sure about this, as I already know the Massive Twist) and Fracis Spufford’s “Golden Hill” (historical, but a gift, so I’ll give it a go” and Stella Gibbon’s “Westwood” on the novel side and Marcus Crouch’s “The Nesbit Tradition”, “The Little Bookstore of Big Stone Gap” by Wendy Welch, Samantha Ellis’ “How to be a Heroine” and Christopher Fowler’s “The Book of Forgotten Authors” on the books about books side. Have you read any of these? Which do you think I’ll enjoy? What’s on your reading calendar for November? 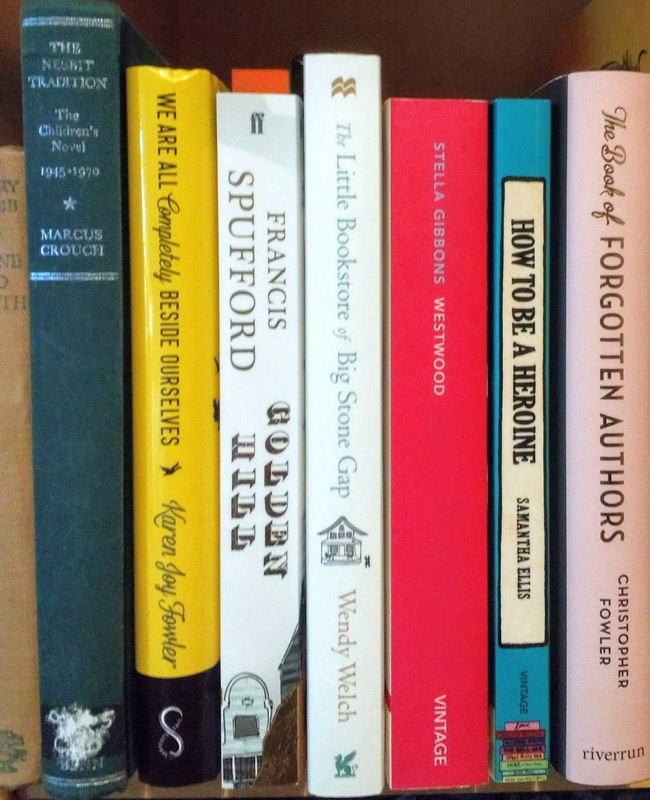 I know a few people are doing Non-Fiction November, but I read quite a lot of non-fiction anyway and frankly I don’t really have time for special blog posts at the moment! But have fun, all who are sailing in that ship! You’ve got a great little set of Christmas catch-ups there; I think you’ll particularly enjoy the book-themed books (I loved Ellis, Fowler and Welch). Like you, I already read plenty of nonfiction so won’t be targeting that this month. Instead I’ll be working on review books and library books as usual but also fitting in as many novellas as possible plus a couple older Atwood books. I know I’m horribly behind the loop with those ones, but at least I know I’ll like them from seeing everyone else’s reactions! Novella November for you, then, which I seem to recall you’ve done before? It’s my third year doing novellas. I don’t know how many I’ll squeeze in, but I have dozens set aside! I’ve read a few by her and think I only have one left after this (you can use the search option on this blog to see the others). They’re all fairly of a type, so if you like one, I’d think you’d like them all. I enjoyed “How to be a Heroine” immensely – lots of bookish content, plus a fascinating autobiographical element. It sounds like you have plenty to look forward to! Everyone whose review I’ve read loved it so I’m really looking forward to it, way behind the curve as I am! Don’t know the books you mention: good luck with your plans. I’m still dipping in to VS Pritchett’s essays, am half way through Elizabeth Smart, By Grand Central Station…and struggling with it. Not sure where to turn after that. Uwe Johnson’s whopper Anniversaries should arrive at the end of the month – daunting. Have accumulated some enticing titles from charity shops recently so will see where the fancy takes me. Wow – immense lack of overlap! I have never read By Grand Central … and now of course I think of Birmingham’s new shopping centre over the rail station every time I hear it mentioned! Enjoy choosing good books to read this month! I’m going to try and do some posts for Non Fiction November – but best laid plans and all that! Indeed! I know my limits, and should really attend to my work blog before doing extras! I might sum up the non-fic at the end of the month or something. Have fun with yours! I am so desperately far behind on my reading list! Hopefully I can carve out some down time to get caught up. Looking forward to hearing about your next reads. I am always about 10 months behind (I read my books in order of acquisition, apart from review books, which I have quite a lot of these days, between reviewing non-fiction for Shiny New Books and having a terrible NetGalley habit. My TBR has been just one shelf long, but not for a long time! Next review is a running book! I enjoyed the book We Are All Completely Beside Ourselves. I think knowing the plot twist won’t ruin it, as the plot twist isn’t really the point of the book. That’s good to know, thank you! Did you see my last review – Mammoth? I linked to your website on it as felt it fitted with your project. Hi Liz, yes, I read it this morning! Thank you!! You have had a good month and some good things coming up too. I have Westwood somewhere in the tbr but won’t fit it in to this year now. I keep getting it mixed up with Nightingale Wood and thinking I have read it. Not sure if Golden Hill would be my kind of book, you will have to let me know. I read We Are All Completely Beside Ourselves. While I remembered the title, I didn’t remember the book, so I went back to my Goodreads review to read what I thought. I have a vague recollection of it being an odd book. It didn’t stand out to me. Right now I’m reading The Clockmaker’s Daughter and I think you’d like this one! I don’t read a lot of historical fiction either, but I adored On Golden Hill. Enjoyed the Karen Joy Fowler and the Christopher Fowler too. Useful to know: thank you! Run Like a Duck comes out here in a couple of weeks, I think it wil be a vacation read if I finish POtter by then. I think it comes out on the 15th here so I’d better get reading!